Winner of the 2010 Pulitzer Prize "A magisterial work...You can't help thinking about the economic crisis we're living through now." --The New York Times Book Review It is commonly believed that the Great Depression that began in 1929 resulted from a confluence of events beyond any one person's or government's control. In fact, as Liaquat Ahamed reveals, it was the decisions made by a small number of central bankers that were the primary cause of that economic meltdown, the effects of which set the stage for World War II and reverberated for decades. 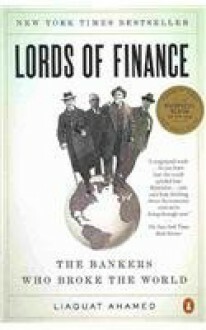 As yet another period of economic turmoil makes headlines today, Lords of Finance is a potent reminder of the enormous impact that the decisions of central bankers can have, their fallibility, and the terrible human consequences that can result when they are wrong.